Billie Holiday’s rendition of “Strange Fruit” and the sounds of lightning and thunder are the very first things you hear as Black Lightning’s pilot episode opens. The haunting cacophony is an ominous warning about the storm coming Jefferson Pierce’s way, but it’s also a promise of what Black Lightning has in store this season. Though Black Lightning isn’t technically a part of the interconnected Arrowverse (at least not yet—there’s a mention of other superheroes on a news report in the episode), it is the latest addition to the stable of Greg Berlanti-produced shows based on DC’s comics that have come to define the CW. 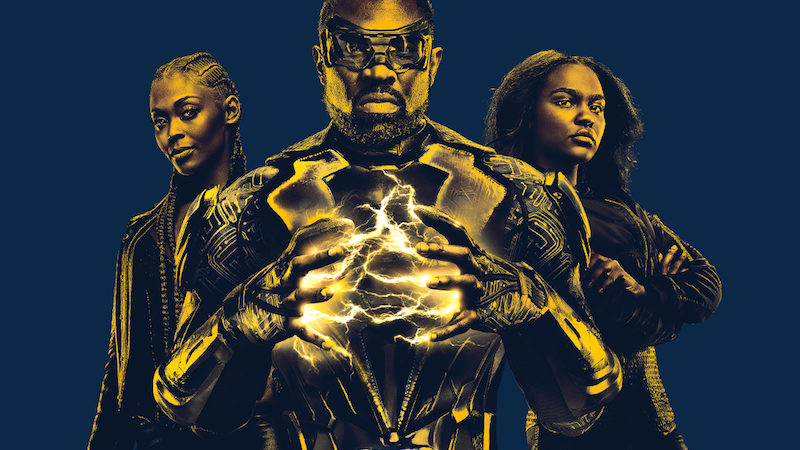 But unlike Arrow, The Flash, Legends of Tomorrow, and Supergirl, Black Lightning dials back the more fantastical elements of superheroism in favor of telling a story that’s more grounded in reality, and which resonates with our own. Black Lightning introduces us to Jefferson Pierce (Cress Williams)—a father, principal, and retired superhero—as he sits in a police station with his youngest daughter Jennifer (China Anne McClain), the brilliant, popular rebel of the family. A newscast blaring in the background details gang-related crime wave sweeping across the city of Freeland that the police seem utterly incapable of shutting down. In response to the violence, activists throughout Freeland take to the streets to protest “the 100”—the gang responsible for much of the chaos—and as is almost always the case with grassroots movements that (perhaps inadvertently) cast the police in a negative light, some of the protesters end up in jail. Protestors like Pierce’s eldest daughter Anissa (Nafessa Williams), a medical student who also teaches part-time at Garfield High School where her father is in charge. Black Lightning quickly establishes the 100 and its leader Tobias Whale as the “traditional” villains we’re meant to root against. But the show also indicates the story we’re meant to pay attention to is about how violence and systemic racism are tearing Freeland’s communities apart. Unlike all of DC’s other live-action television shows, Black Lightning takes the time to thoughtfully flesh out and give texture to the community and people that its titular hero has sworn to protect. Freeland feels like a vibrant, if troubled, place full of black people with rich, fulfilling lives. I mention race here because Black Lightning is infused with a kind of unabashed, unmistakable blackness that’s unlike anything else that’s been on the CW in years. Yes, there have been a number of black characters on the network’s various superhero shows over the years and many of them have been incredibly important, but none of them have ever been depicted as being a deeply-rooted part of a predominantly black community where their experiences as people are understood to be the norm. Early into Black Lightning’s first episode, there’s a scene where Jefferson is pulled over by two police officers and made to get out of his car into the pouring rain while he’s patted down and pinned against the police cruiser as his terrified daughters look on in horror. In that moment, Jefferson is still Black Lightning, but he is also Philando Castile, Alton Sterling, Sandra Bland and every single black person who has ever known the fear of being black and confronted by the police for something you haven’t done. Black Lightning presents the encounter as a familiar kind of trauma Jefferson and his daughters are keenly familiar with by dint of knowing what Freeland’s crooked, racist police can be like. What will be interesting to see is how the CW’s audience responds to the show’s frank and raw portrayal of these kinds of racist aggressions that people like the Pierces (and many in the real world) are forced to go through on a daily basis. In Black Lightning, the kids at Garfield High, the gang members in the 100, and even the Freeland Police Department are all part of one larger, interconnected tapestry that’s being threatened by those who would see it all burn down in order to gain personal power. Jefferson understands that it’s that larger threat, moreso than any individual criminal Freeland’s about to face, and that knowledge is what gives him the resolve to bring Black Lightning out of retirement. Super-teams are nothing new for the CW, but Black Lightning also sets itself apart by laying the groundwork for the intergenerational clash between Jefferson and his daughters that’s sure to develop as the season progresses. In the comics, both Anissa and Jennifer eventually come into metahuman powers of their own and become the heroes Thunder and Lightning. Black Lightning’s take on the sisters casts them as loving daughters who are both able to see the strengths and weaknesses in their father’s approach to things. They’re very much a team in the familial sense, but it’ll be fascinating to watch how their relationships mature and evolve once the three Pierces are all in play as superpowered vigilantes. What the first episode of Black Lightning holds back on in terms of whiz-bang comic book action, it makes up for in careful, deliberate world-building that’s meant to make you care about its characters. Like Jefferson, we’re supposed to see the good in Freeland through all of the destruction and chaos threatening to destroy it. If the stakes of the show feel small at first, it’s only because Black Lightning’s done its job in crafting a story about real people living on the ground who’re just trying to get by and live their lives. They’re the people Jefferson wants to protect and they’re what makes Black Lightning something special. How is it that Black Lightning isn’t electrocuting people to death when he picks them up with electricity? Seems like the sort of thing that’d kill people. James Remar plays Peter Gambi, the tailor who also builds Black Lightning’s costume and provides him with technical support. Remar also portrayed Lord Rayden in Mortal Kombat: Annihilation. So, in a way Rayden and Jefferson Pierce are lightning buds. Oddly enough, Black Lightning is also an alt-skin for Raiden in Injustice 2. Black Lightning’s suit looks incredibly uncomfortable—like it pinches and cuts and bruises. I could watch Anissa and Jennifer fight for an entire episode and it still wouldn’t be enough. This may be the first time we’ve seen recreational drug use on a CW show (especially a superhero show) where the person partaking didn’t end up dead or in some kind of terrible accident. That teenager was just blazing up at the party and it wasn’t a big deal. What is it about Jefferson’s powers that seemingly cause him physical injury and does it have anything to do with Tobias Whale and why he stopped being Black Lightning for a while? TOBIAS WHALE SHOT THAT MAN WITH A HARPOON. YOU GO, TOBIAS WHALE.